Once every four years, America’s civil engineers provide a comprehensive assessment of the nation’s major infrastructure categories in ASCE’s Report Card for America’s Infrastructure (Report Card). Using a simple A to F school report card format, the Report Card provides a comprehensive assessment of current infrastructure conditions and needs, both assigning grades and making recommendations for how to raise the grades. An Advisory Council of ASCE members assigns the grades according to the following eight criteria: capacity, condition, funding, future need, operation and maintenance, public safety, resilience, and innovation. Since 1998, the grades have been near failing, averaging only Ds, due to delayed maintenance and underinvestment across most categories. 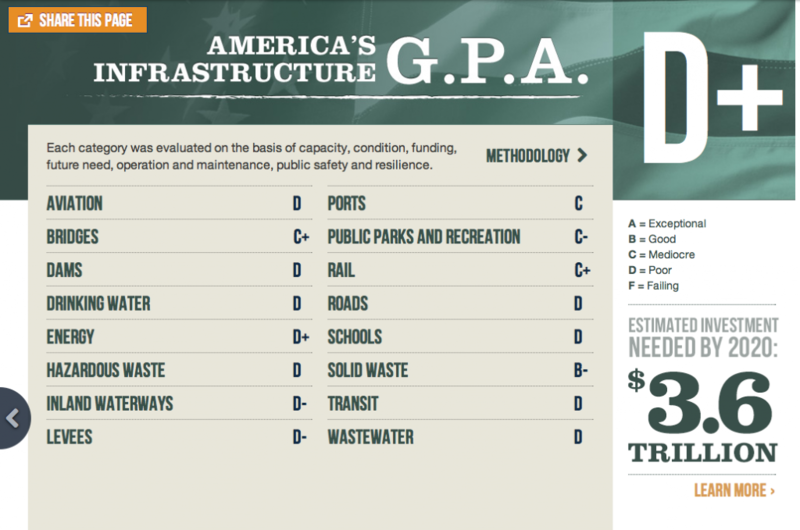 Now the 2013 Report Card grades are in, and America’s cumulative GPA for infrastructure rose slightly to a D+. The grades in 2013 ranged from a high of B- for solid waste to a low of D- for inland waterways and levees. Solid waste, drinking water, wastewater, roads, and bridges all saw incremental improvements, and rail jumped from a C- to a C+. No categories saw a decline in grade this year. The 2013 Report Card demonstrates that we can improve the current condition of our nation’s infrastructure — when investments are made and projects move forward, the grades rise. For example, greater private investment for efficiency and connectivity brought improvements in the rail category; renewed efforts in cities and states helped address some of the nation’s most vulnerable bridges; and, several categories benefited from short-term boosts in federal funding. Full interactive website of this report by Launching the Report Card, this report was created by ASCE. We know that investing in infrastructure is essential to support healthy, vibrant communities. Infrastructure is also critical for long-term economic growth, increasing GDP, employment, household income, and exports. The reverse is also true – without prioritizing our nation’s infrastructure needs, deteriorating conditions can become a drag on the economy. While the modest progress is encouraging, it is clear that we have a significant backlog of overdue maintenance across our infrastructure systems, a pressing need for modernization, and an immense opportunity to create reliable, long-term funding sources to avoid wiping out our recent gains. Overall, most grades fell below a C, and our cumulative GPA inched up just slightly to a D+ from a D four years ago. 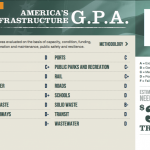 We invite you to take a deeper look at the nation’s infrastructure conditions in the 2013 Report Card – from the state infrastructure facts, to the interactive charts, to our three key solutions. A brief summary of the findings for each category is below. Dams: Dams again earned a grade of D. The average age of the 84,000 dams in the country is 52 years old. The nation’s dams are aging and the number of high-hazard dams is on the rise. Many of these dams were built as low-hazard dams protecting undeveloped agricultural land. However, with an increasing population and greater development below dams, the overall number of high-hazard dams continues to increase, to nearly 14,000 in 2012. The number of deficient dams is currently more than 4,000. The Association of State Dam Safety Officials estimates that it will require an investment of $21 billion to repair these aging, yet critical, high-hazard dams. Drinking Water: The grade for drinking water improved slightly to a D. At the dawn of the 21st century, much of our drinking water infrastructure is nearing the end of its useful life. There are an estimated 240,000 water main breaks per year in the United States. Assuming every pipe would need to be replaced, the cost over the coming decades could reach more than $1 trillion, according to the American Water Works Association (AWWA). The quality of drinking water in the United States remains universally high, however. Even though pipes and mains are frequently more than 100 years old and in need of replacement, outbreaks of disease attributable to drinking water are rare. Hazardous Waste: There has been undeniable success in the cleanup of the nation’s hazardous waste and brownfields sites. However, annual funding for Superfund site cleanup is estimated to be as much as $500 million short of what is needed, and 1,280 sites remain on the National Priorities List with an unknown number of potential sites yet to be identified. More than 400,000 brownfields sites await cleanup and redevelopment. The Environmental Protection Agency (EPA) estimates that one in four Americans lives within three miles of a hazardous waste site. The grade for hazardous waste remained unchanged at a D.
Levees: Levees again earned a near failing grade of D- in 2013. The nation’s estimated 100,000 miles of levees can be found in all 50 states and the District of Columbia. Many of these levees were originally used to protect farmland, and now are increasingly protecting developed communities. The reliability of these levees is unknown in many cases, and the country has yet to establish a National Levee Safety Program. Public safety remains at risk from these aging structures, and the cost to repair or rehabilitate these levees is roughly estimated to be $100 billion by the National Committee on Levee Safety. However, the return on investment is clear – as levees helped in the prevention of more than $141 billion in flood damages in 2011. Solid Waste: In 2010, Americans generated 250 million tons of trash. Of that, 85 million tons were recycled or composted. This represents a 34% recycling rate, more than double the 14.5% in 1980. Per capita generation rates of waste have been steady over the past 20 years and have even begun to show signs of decline in the past several years. The grade for solid waste improved in 2013, and it earned the highest grade of B-. Wastewater: The grade for wastewater improved slightly to a D. Capital investment needs for the nation’s wastewater and stormwater systems are estimated to total $298 billion over the next 20 years. Pipes represent the largest capital need, comprising three quarters of total needs. Fixing and expanding the pipes will address sanitary sewer overflows, combined sewer overflows, and other pipe-related issues. In recent years, capital needs for the treatment plants comprise about 15%-20% of total needs, but will likely increase due to new regulatory requirements. Stormwater needs, while growing, are still small compared with sanitary pipes and treatment plants. Since 2007, the federal government has required cities to invest more than $15 billion in new pipes, plants, and equipment to eliminate combined sewer overflows. Aviation: Despite the effects of the recent recession, commercial flights were about 33 million higher in number in 2011 than in 2000, stretching the system’s ability to meet the needs of the nation’s economy. The Federal Aviation Administration (FAA) estimates that the national cost of airport congestion and delays was almost $22 billion in 2012. If current federal funding levels are maintained, the FAA anticipates that the cost of congestion and delays to the economy will rise from $34 billion in 2020 to $63 billion by 2040. Aviation again earned a D.
Bridges: Over two hundred million trips are taken daily across deficient bridges in the nation’s 102 largest metropolitan regions. In total, one in nine of the nation’s bridges are rated as structurally deficient, while the average age of the nation’s 607,380 bridges is currently 42 years. The Federal Highway Administration (FHWA) estimates that to eliminate the nation’s bridge backlog by 2028, we would need to invest $20.5 billion annually, while only $12.8 billion is being spent currently. The challenge for federal, state, and local governments is to increase bridge investments by $8 billion annually to address the identified $76 billion in needs for deficient bridges across the United States. However, with the overall number of structurally deficient bridges continuing to trend downward, the grade improved to C+. Inland Waterways: Our nation’s inland waterways and rivers are the hidden backbone of our freight network – they carry the equivalent of about 51 million truck trips each year. In many cases, the inland waterways system has not been updated since the 1950s, and more than half of the locks are over 50 years old. Barges are stopped for hours each day with unscheduled delays, preventing goods from getting to market and driving up costs. There is an average of 52 service interruptions a day throughout the system. Projects to repair and replace aging locks and dredge channels take decades to approve and complete, exacerbating the problem further. Inland waterways received a D- grade once again as conditions remain poor and investment levels remain stagnant. Ports: This new category for 2013 debuted with a grade of C. The U.S. Army Corps of Engineers estimates that more than 95% (by volume) of overseas trade produced or consumed by the United States moves through our ports. To sustain and serve a growing economy and compete internationally, our nation’s ports need to be maintained, modernized, and expanded. While port authorities and their private sector partners have planned over $46 billion in capital improvements from now until 2016, federal funding has declined for navigable waterways and landside freight connections needed to move goods to and from the ports. Rail: Railroads are experiencing a competitive resurgence as both an energy-efficient freight transportation option and a viable city-to-city passenger service. In 2012, Amtrak recorded its highest year of ridership with 31.2 million passengers, almost doubling ridership since 2000, with growth anticipated to continue. Both freight and passenger rail have been investing heavily in their tracks, bridges, and tunnels as well as adding new capacity for freight and passengers. In 2010 alone, freight railroads renewed the rails on more than 3,100 miles of railroad track, equivalent to going coast to coast. Since 2009, capital investment from both freight and passenger railroads has exceeded $75 billion, actually increasing investment during the recession when materials prices were lower and trains ran less frequently. With high ridership and greater investment in the system, the grade for rail saw the largest improvement, moving up to a C+ in 2013. Roads: Targeted efforts to improve conditions and significant reductions in highway fatalities resulted in a slight improvement in the roads grade to a D this year. However, forty-two percent of America’s major urban highways remain congested, costing the economy an estimated $101 billion in wasted time and fuel annually. While the conditions have improved in the near term, and federal, state, and local capital investments increased to $91 billion annually, that level of investment is insufficient and still projected to result in a decline in conditions and performance in the long term. Currently, the Federal Highway Administration estimates that $170 billion in capital investment would be needed on an annual basis to significantly improve conditions and performance. Transit: The grade for transit remained at a D as transit agencies struggled to balance increasing ridership with declining funding. America’s public transit infrastructure plays a vital role in our economy, connecting millions of people with jobs, medical facilities, schools, shopping, and recreation, and it is critical to the one-third of Americans who do not drive cars. Unlike many U.S. infrastructure systems, the transit system is not comprehensive, as 45% of American households lack any access to transit, and millions more have inadequate service levels. Americans who do have access have increased their ridership 9.1% in the past decade, and that trend is expected to continue. Although investment in transit has also increased, deficient and deteriorating transit systems cost the U.S. economy $90 billion in 2010, as many transit agencies are struggling to maintain aging and obsolete fleets and facilities amid an economic downturn that has reduced their funding, forcing service cuts and fare increases. Public Parks and Recreation: The popularity of parks and outdoor recreation areas in the United States continues to grow, with over 140 million Americans making use of these facilities a part of their daily lives. These activities contribute $646 billion to the nation’s economy, supporting 6.1 million jobs. Yet states and localities struggle to provide these benefits for parks amid flat and declining budgets, reporting an estimated $18.5 billion in unmet needs in 2011. The federal government is also facing a serious challenge as well since the National Park Service estimates its maintenance backlog at approximately $11 billion. The grade for parks remained unchanged at a C-. Schools: Almost half of America’s public school buildings were built to educate the baby boomers – a generation that is now retiring from the workforce. Public school enrollment is projected to gradually increase through 2019, yet state and local school construction funding continues to decline. National spending on school construction has diminished to approximately $10 billion in 2012, about half the level spent prior to the recession, while the condition of school facilities continues to be a significant concern for communities. Experts now estimate the investment needed to modernize and maintain our nation’s school facilities is at least $270 billion or more. However, due to the absence of national data on school facilities for more than a decade, a complete picture of the condition of our nation’s schools remains mostly unknown. Schools received a D again this year. Energy: America relies on an aging electrical grid and pipeline distribution systems, some of which originated in the 1880s. Investment in power transmission has increased since 2005, but ongoing permitting issues, weather events, and limited maintenance have contributed to an increasing number of failures and power interruptions. While demand for electricity has remained level, the availability of energy in the form of electricity, natural gas, and oil will become a greater challenge after 2020 as the population increases. Although about 17,000 miles of additional high-voltage transmission lines and significant oil and gas pipelines are planned over the next five years, permitting and siting issues threaten their completion. Thus, the grade for energy remained a D+. Infrastructure is the foundation that connects the nation’s businesses, communities, and people, driving our economy and improving our quality of life. For the U.S. economy to be the most competitive in the world, we need a first class infrastructure system – transport systems that move people and goods efficiently and at reasonable cost by land, water, and air; transmission systems that deliver reliable, low-cost power from a wide range of energy sources; and water systems that drive industrial processes as well as the daily functions in our homes. Yet today, our infrastructure systems are failing to keep pace with the current and expanding needs, and investment in infrastructure is faltering. We must commit today to make our vision of the future a reality – an American infrastructure system that is the source of our prosperity.